making cryptocurrency mining a lot easier and accessible for everyone who is interested in becoming miners. You will be able to be a part of the community through an uncomplicated process and start earning masternode rewards from the get-go. We believe that honesty is gained through transparency. 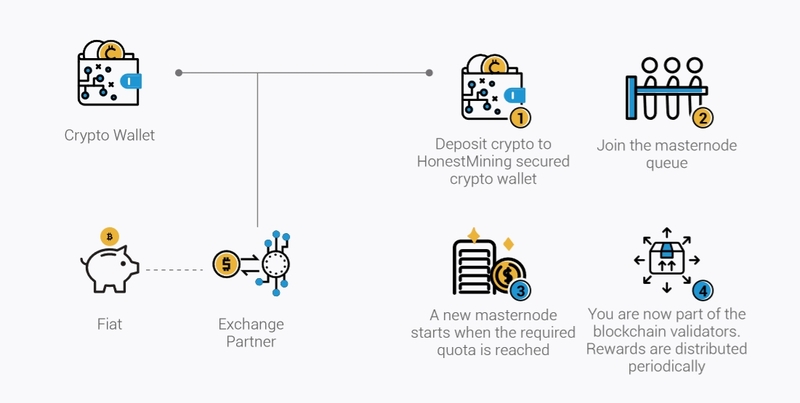 HONEST MINING - a company with a simple mission: building trustworthy and easy crypto mining that is accessible to everyone. HONEST MINING will achieve this by looking at both the short- and long-term impact of mining. 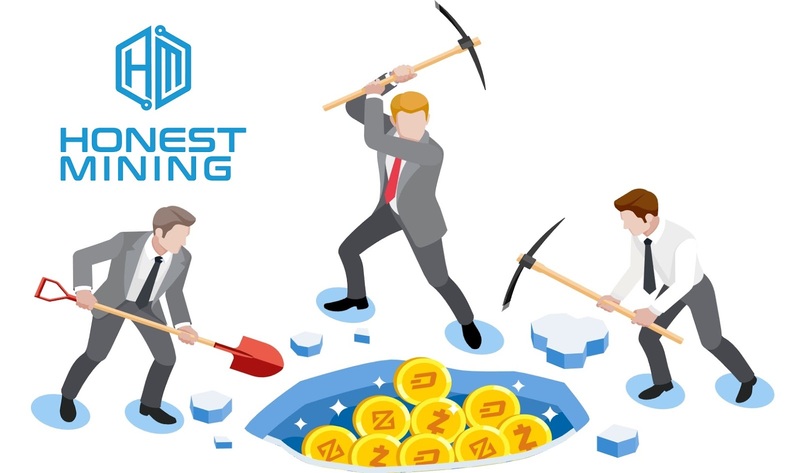 HONEST MINING will be launching the next generation platform for cloud mining Proof-of-Stake-based cryptocurrency (PoS). The platform is a highly automated and secured staking pool with very low minimum commitment. 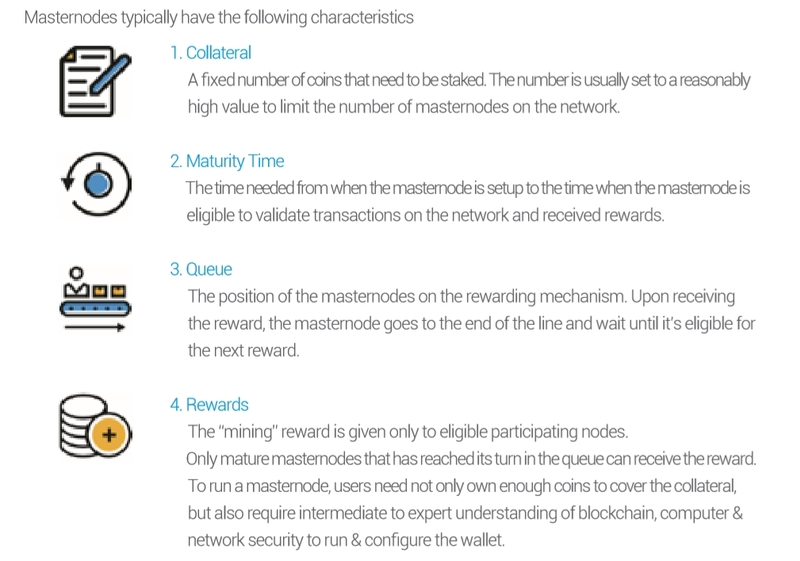 Miners can get their rewards based on the masternode reward distribution without losing any of their collateral. HONEST TOKEN (HNST) will be used for the platform economics. HONEST MINING will seek to grow the mining community even further with Project ALEXANDRIA - a mining knowledge bank powered by the community. As a long-term project, HONEST MINING understands that this is not a simple mission. There are hundreds of active blockchain projects, each utilizing its own unique approach; that being said, we are confident that our current proposal is a step closer to reaching our goal. On Proof of Stake, a validator may validate block transactions if they hold a stake on the blockchain network. PoS decentralizes the consensus power by ensuring rewards are distributed based on the number of coins staked by the miner. As such, the selection is strongly influenced by those that have the most coins – the more stake they have in the network, the more they have to lose in the event of a mishap. The other determining factor is the length of time for which the coins have been owned, as it indicates whether the coins are in a long-term position – which is considered a more trustworthy position in comparison to coins that have been acquired recently. As PoS miners need to stake their cryptocurrency in order to mine, they need to believe in the cryptocurrency itself in order to get the reward. 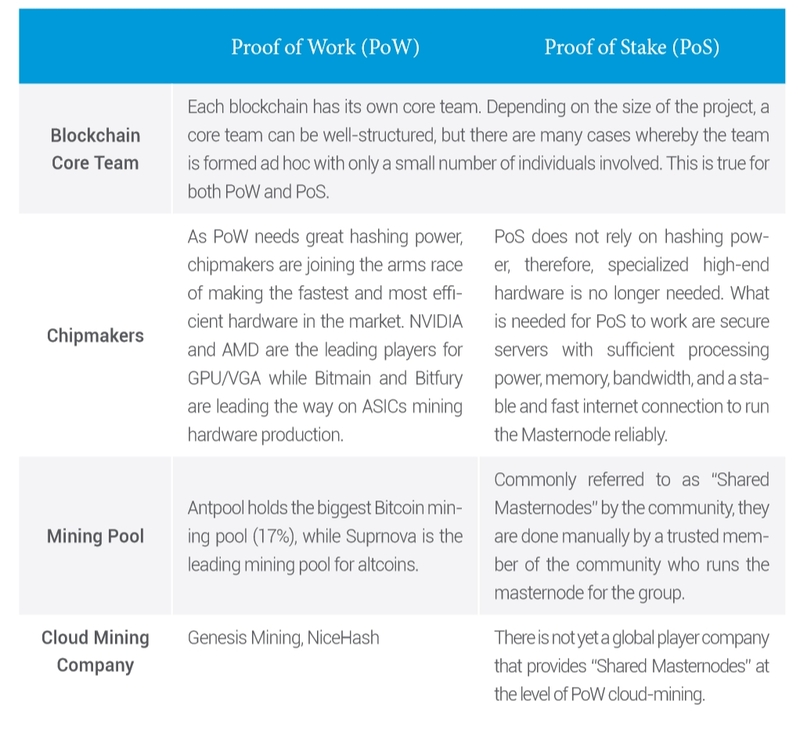 Similar to PoW, the miner needs to understand how to run and configure the latest version of the relevant software in order to support the network. PoS is still in its infancy. Amongst the PoS cryptocurrencies, DASH is leading based on market capitalization. As of Q2 of 2018, PoS cryptocurrencies constitute less than 5% of the total market capitalization. This will surely change as Ethereum is finalizing its plan to launch CASPER, enabling Ethereum to be a PoS-based cryptocurrency. When this happens, the market capitalization of PoS coins should increase dramatically and more coins should be following Ethereum and making the jump towards PoS. Although PoS has many advantages over PoW, the “nothing at stake” condition allows miners to vote on multiple chains. This is especially dangerous during chain-split/fork condition. While it is true that miners are making the blockchain network decentralized, there are still big barriers to entry that prevents everyone from joining: limited knowledge, limited technical skills, limited financial resources, and limited infrastructure being the main reasons. As of July 2018, there are more than 360 blockchains running various masternodes with different variation of staking and rewarding rules. All a user needs to know is how to transfer coins of their desired cryptocurrency to HONEST MINING’s designated secure wallet, and HONEST MINING will on the user’s behalf stake these coins on the cryptocurrency’s network. All masternodes have a maturity time - a waiting time from when the masternode is generated to the time they start generating rewards. Instant Masternode, on the other hand, is an innovation by HONEST MINING that lets you start earning immediately. 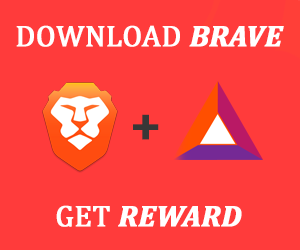 It eliminates the need of waiting for the masternode to be filled and properly set prior to reward-earning. More coins will be added over time based on the market demand, strong team credibility, mature blockchain technology, and user base. For smaller-cap coins, HONEST MINING will do community voting to determine the public interest. HONEST MINING is going to be mainly an optimized web platform that’s reachable from web browser on mobile devices (phone/tablet), or desktop/laptop devices. REST API will be available for sophisticated miners. Android & iOS Client are going to be developed when the platform matures and requires such needs. 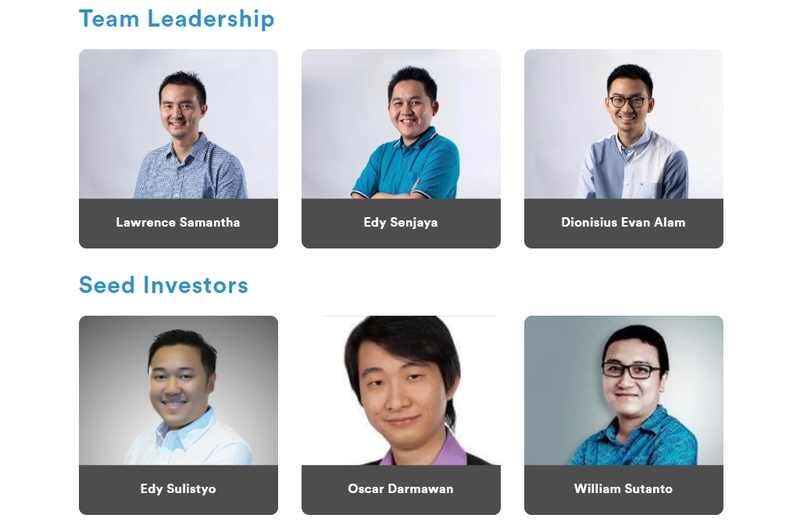 Our team consists of experienced cryptocurrency and blockchain industry players who believe in decentralization. Together, we are achieving our mission: to build a trustworthy crypto mining platform that is easy to use and accessible to everyone. To stay up to date on Honest Mining news and announcements, subscribe to Medium and Steemit channels, follow on Facebook and Twitter, and join the conversation on Telegram.